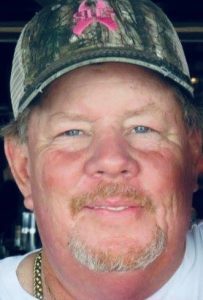 Lyle LeRoy Nifong, Jr., 60, passed away on April 11, 2019. He is survived by his wife Carol Nifong and five children; Son Lyle Nifong III and wife Brandy Nifong, son Brad Rogers, and son Taylor White; daughters Elysia Nifong and Sarah Glass; grandchildren Casin, Liam, Callaway, and Giuliana Nifong; brother Lance Nifong and wife Terry Nifong; uncle Butler McCauley and wife Barbara; several nieces and nephews, and many friends. Lyle Nifong will be remembered for always putting a smile on others faces and lending a helping hand when others needed it. Services will be held at 6:00 pm, Thursday, April 18, 2019, at Crowder Funeral Home Chapel, Dickinson, TX. Memorial donations may be made to the SPCA or there will be a donation site for animal food and supplies during service hours. Your generosity, smiles, great hugs and the Love for others will always be remembered. I’m so honored that Curtis and I came to be your friends. Rest easy. Carol and Elysia prayers and Love to you during this difficult time. We are here for you. Only a phone call away. Thank you Lyle for always being a kind and heartless person. SHS SISTERS WILL NEVER FORGET HOW YOU HAVE IMPACTED SO MANY. Lyle 111, sorry to hear of the loss of your dad. Praying for GOD’S COMFORT. Lyle, I’m so sorry to hear this bad news. I wish your family all the best. Thank you for all you and your Dad have done for me. This man had a heart of Gold he was a true giver!!!!!! Working with Lyle was one of the only positive memories that I have from my days with Sullivan Land Services. He had a kind heart and soul. I wish peace upon him and for your family. Carol, so sorry for your loss. Lyle was always helping someone and never step away from helping. Thank you Lyle for your love that went out to those who knew you. Lyle was a good man. Lyle was a huge player in the transition of our life with our businesses. I don’t know that we would be where we are today without his help. Lyle was kind, funny, and a community man. We are saddened by this news and pray for comfort, peace, and understanding for his family.